Torbay Council should take a leaf out of neighbouring Teignbridge's book. Every Sunday, during the quieter months until March 2013, Teignbridge Council have waived car parking charges. It's an incentive to lure people away from the out-of-town superstores and retail parks, and get them back into town centres again. Mill Marsh Park is situated just before the town centre. 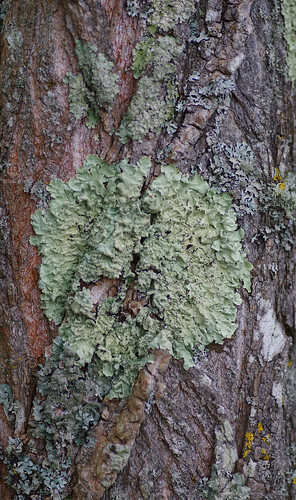 We crossed the main road opposite the car park and set out to look for tree lichens. As Bovey Tracey lies just outside the Dartmoor National Park boundary I wondered if the park would be a cross-over zone, linking urban species with a higher tolerance of air pollution to those that prefer purer, cleaner air. There were still sprinklings of sawdust around this recently felled giant. I first thought that this might be a diseased tree but they are usually burned. But this tree is a casualty of Britain's cycling boom. 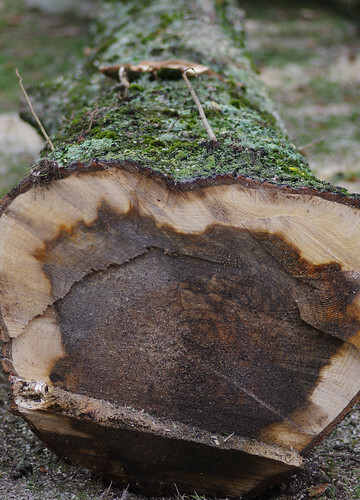 Along with eight others it has been chainsawed to make way for Phase Four of the Wray Valley Trail, linking Bovey Tracey with Moretonhampstead. Was this really necessary? The path through the park is undefined in places but appears sufficiently wide. How many budding Bradley Wigginses can be expected to come through at once? Don't get me wrong, I think it's admirable that fitness is being promoted and that more cycling trails will potentially reduce road deaths each year. But I also think there should be places and spaces where people are free and unhindered to watch the natural world unfold in front of them. For me, the countryside primarily provides a means of relaxation: an opportunity to engage with nature and to learn from it. To slow down. To breathe. And to notice things I have never seen before. I have gained a sense that I cannot fully appreciate my surroundings if I am constantly rushing everywhere. I certainly would not have noticed this if I was speeding past, trying to beat a personal best. Sherry experimented with a narrow depth of field until getting the desired results. The Ramalinas have elongated, strap-shaped stems a bit like tagilatelle. 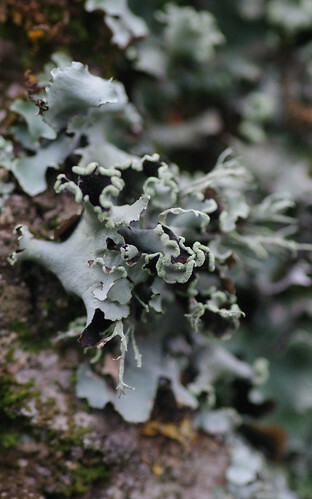 The Parmelia group of lichens have been split into different groups and reclassified. 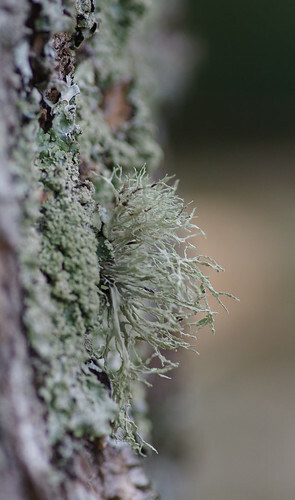 Because there are relatively few lichenologists (when compared to botanists, for example), research has thrown up many breakthrough discoveries. I would certainly like to discover more about how interconnected different species are. Often, there are many different species present on the same tree. Sometimes one can grow through another. Is the relationship between them always competitive or can it be symbiotic? 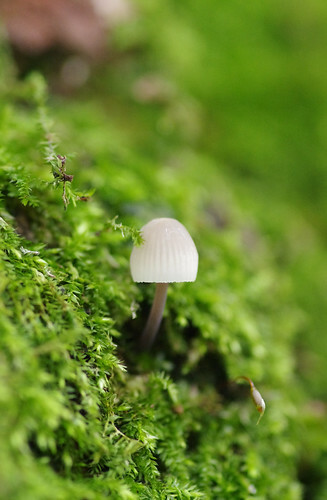 I spotted this tiny fungi among a mossy tree trunk. It was translucent and delicate-looking with the veins like a pattern on porcelain. It was almost pleated at the bottom and required a few shots until it came out as we saw it. This is another common species in the South West of England. Before we began to look for lichens we must have seen it literally hundreds of times and not noticed it. The crimped edges with soralia (the minute structures containing both algal and fungal cells) and the black and tan-coloured undersides are distinguishing features. All of the photos above were taken within about hundred metres of each other. At the far end of the park, the low bridge under the main road had been sealed off. We crossed the busy main road instead and entered Parke Estate. 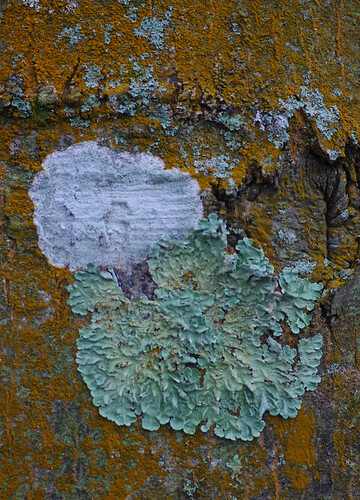 There were so many photos of fungi and lichens that I have decided to split them into a separate blog entry. But we did return through the park on our way back to take a few more pictures. When I see a tree like this I am often inspired to breathe deeply and inhale as much clean air as possible. This is a bit like a tonic for the lungs. It helps to take a deep breath and then exhale and say a loud 'AH'. Though it should be said that getting too carried away the results can sound akin to a demented Tarzan swinging through the vines, causing expressions of alarm from onlookers. This algae can often be found on trees and rocks. Up close, it appears feathery and frilly. 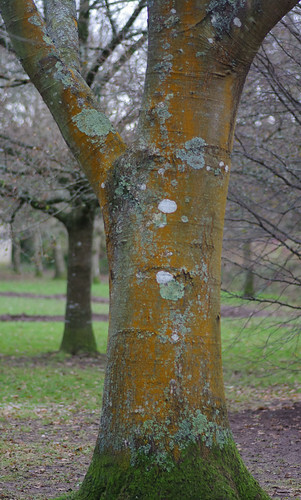 On neighbouring trees it varied between the yellow seen above and an impressive orange. Here it is again, providing the orange background. 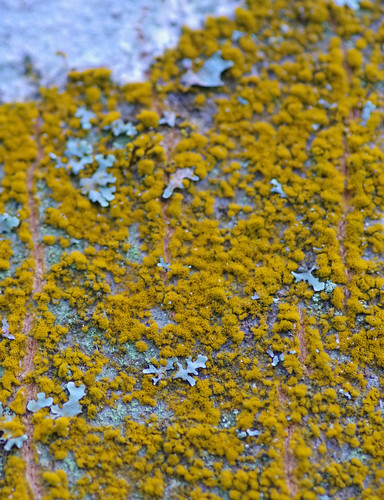 The green foliose (leafy) lichen is Flavoparmelia caperata. The white lichen above it has joined a cast of many mysteries. 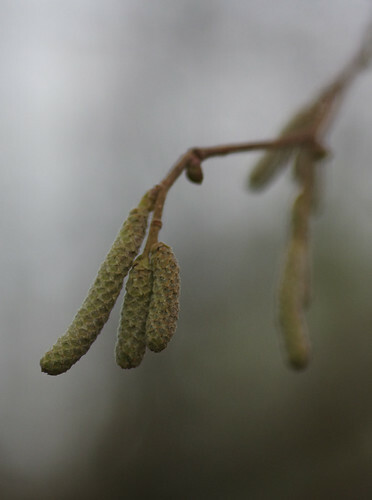 In grey, fading light, these stalked catkins provided the last useable shot of the day. It will be interesting to come back in a few months and see the marked contrast when the trees have leaves and are flowering. With thanks to John and Lizzie Cowling for being our extra eyes and ears.